Brighter than ever. 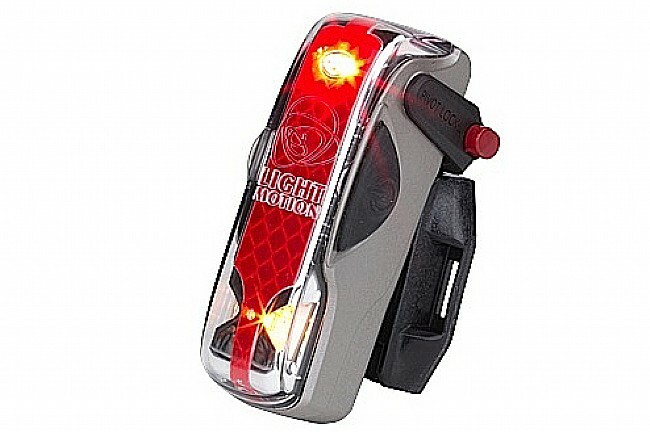 You're sure to make your presence known with the Light and Motion Vis 180 Tail Light. This updated design delivers a retina-searing 70 Lumen output that's far brighter than the most powerful AA tail lights on the market. Brilliant amber side lights add 180-degree visibility and let the cars know you belong on the road too. And, convenient USB charging means your days of buying replacement batteries are over. 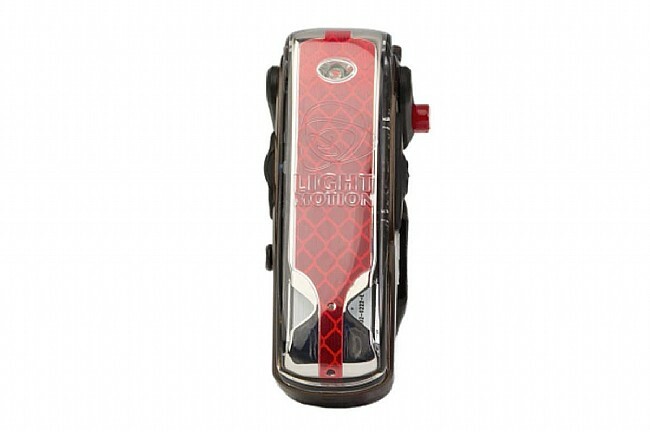 The Vis 180 Tail Light is available in various colors. Rechargeable Li-ion battery. System weight (claimed): 102 grams. 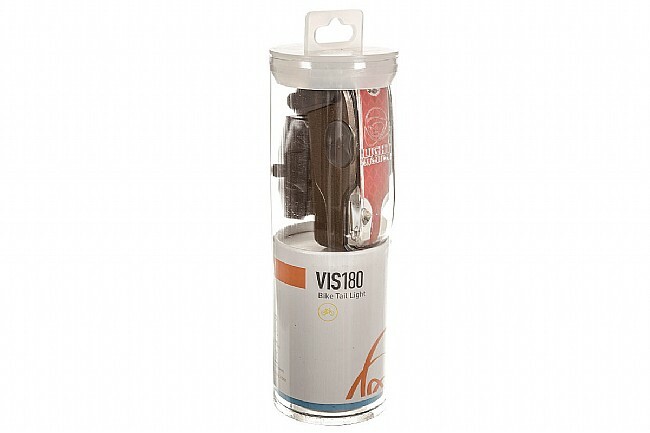 Note: Packaging for the Vis 180 may indicate a power of 50 lumen, but we have been assured by Light & Motion that all products shipped out are rated at 70 lumen. I use mine for daytime visibility, and in the 1 pulsing mode it gives me 6 hours of battery life, adequate for most of my rides. It seems plenty bright. I bought extra mounts for about $10 and put one mount on each bike. The mount worked nicely on the seatpost of one bike, but when I mounted it on the other bike's seatpost there was insufficient clearance under my seatbag to slide it upwards to remove it. So I had to attach the mount upside down on one of the seat stays, which works fine. 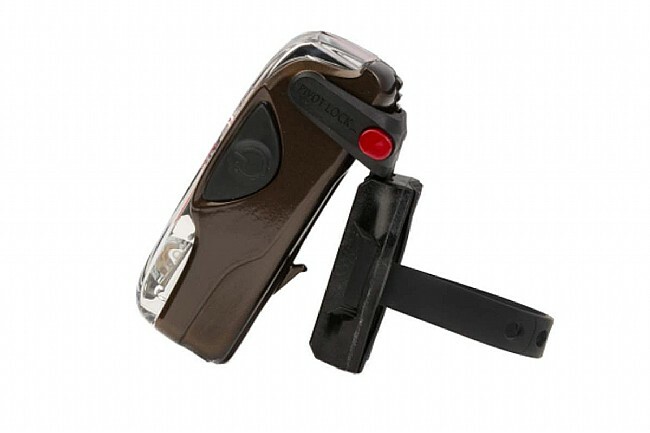 As for the extra-long mounting strap getting in the way, you can simply shorten it with a scissors. I'm very pleased with my Vis 180. There are four modes 70 lumens (red)25 lumens (yellow) blinking, 35 lumens (red) blinking13 lumens (yellow), 75 lumens (red) constant, and 5 lumens (yellow) blinking. Whereas some reviewers have complained about the strap being too long, it is easy to deal with the extra length by double looping it. My only complaint is that this light is a little heavy, but it is very bright and it attaches easily to my seat stay. I am only 5'4 so I do not have room on my seat post to mount a light. I must mount a light on my seat stay. Note I mount the light upside down so that the angle is directed horizontally. I like this light. Much brighter than what I had before Serfas Thunderbolt Tail Light (UTL-6). This Light & Motion taillight weighs 100g on my Park gram scale.